Provide comfort for the family of Ruby Green with a meaningful gesture of sympathy. Ruby Green, 94 of Stephenville died Wednesday, April 3, 2019 in Stephenville. Graveside services will be at 2:00 PM Sunday, April 7th at Oakview Cemetery near Mullin, TX in Mills County. Ruby was born on July 6, 1924 in Mills County to the late Claude Austin and Ophelia Ellen Cox Gandy. She graduated from Mullin High School, and lived most of her life in Mills County. She moved to Stephenville in 1998 to be near her family. Ruby was a member of the Church of Christ. She loved to study the Bible, and had committed many scripture passages to memory. Ruby was a homemaker who dearly loved her family. Ruby was also an excellent cook, and enjoyed flower gardening. 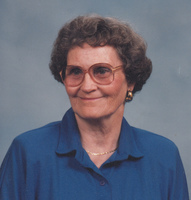 Ruby is survived by her children, Jimmy Green and wife Jackie of Gatesville and Gayla Boucher and husband Michael of Stephenville; grandchildren, Marty Green and wife Brandi of Huntsville, Cody Damron and wife of Natalie of Stephenville, Brooke Mielinski and husband Dan of Aledo; great grandchildren Kagen Green, Cole Damron, Carsyn Damron, Joshua Cox, Matthew Cox, Maelie Mielinski, Avery Mielinski, and baby girl Mielinski who is due to be born in June. Memorials may be made to Foster’s Home for Children, P. O. Box 978, Stephenville, Texas 76401, or to Cherokee Home for Children, P. O. Box 295, Cherokee, Texas 76832. The Green family wishes to thank Dr. Miranda Nash, Oakwood Assisted Living, Stephens Home Health Care, and CCS Hospice for their loving care. To send flowers in memory of Ruby Green, please visit our Heartfelt Sympathies Store. Provide comfort for the family of Ruby Green by sending flowers.